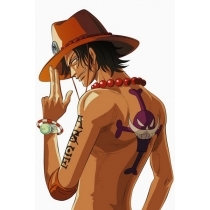 One Piece Portgas D Ace wears the red bead necklace every day. It's a mark of him. Size: The length of the necklace is about 50cm. The diameter of the beads is about 2.5cm. The thread is elastic and could be stretched.